This well-established international series examines major areas of basic and clinical research within neuroscience, as well as emerging and promising subfields. This volume explores interdisciplinary research on invertebrate and vertebrate models of odor memory and perception, as well as human odor memory and perception. 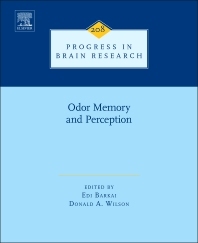 This book brings together a collection of authors that cut across model systems, techniques, levels of analysis and questions to highlight important and exciting advances in the area of olfactory memory and perception. The chapters highlight the unique aspects of olfactory system anatomy, local circuit function, odor coding and plasticity. The authors are leading authorities in the field. Edi Barkai, Ph.D. - I received my doctorate from Ben-Gurion University in Israel and post-doctoral training at the psychology department at Harvard. I am currently Professor of physiology and Dean of the Faculty of Natural Sciences at the University of Haifa, Israel. My primary interest is the cellular mechanisms underlying learning and memory in the mammalian brain. In particular, I have been studying the biological bases of higher-skill learning. To that aim, I adopted a complex olfactory-discrimination task. Training rats in this particularly difficult task results with acquisition of superb capabilities to perform complex tasks, termed ‘rule learning’ or ‘learning set. The long-term modifications at the cellular, sub cellular and network levels that enable 'rule learning' acquisition and maintenance have been the subject of our research. We have been focusing on several key questions; what are the physiological, morphological and molecular mechanisms that enable the induction and long-term maintenance of enhanced learning capabilities? What roles do different brain areas have in these enhanced capabilities? How is the balanced activity maintained in the relevant neuronal networks in face of such multiple changes? We showed that at the cellular level learning-induced long-term modifications occur in the three components controlling neurons activation; the excitatory synaptic, the intrinsic neuronal excitability, and synaptic inhibition. Such modifications are maintained by persistent activation of key second messenger systems. Based on our result, we have been also engaged in developing a cognitive enhancer that will compensate for aging-induced and neurodegeneration-induced decline in cognitive capabilities. Donald A. Wilson, Ph.D. - I received my doctorate from McMaster University in Ontario Canada and post-doctoral training at the University of California at Irvine. My first faculty position was at the University of Oklahoma where I rose to Professor. I am currently Professor of Child & Adolescent Psychiatry and Neuroscience & Physiology at New York University Langone School of Medicine and Senior Research Scientist in the Emotional Brain Institute at the Nathan Kline Institute for Psychiatric Research. My lab and I are interested in how the mammalian brain processes and remembers information. As a model system we focus on rodent (rats and mice) discrimination and memory for odors. Using electrophysiological, behavioral, genetic, neuroanatomical and pharmacological approaches we explore the neurobiology of memory and the role of experience in sensory system function. The underlying hypothesis of much of our work is that memory plays a critical role in even basic sensory discrimination. That is, your perception of the world is not static but reflects your past experiences. Some specific questions we are addressing include: how does sensory experience shape odor discrimination? ; how does sensory encoding reflect hedonic/emotional associations of odors? ; what role does sleep play in olfactory perceptual learning? ; how do local neural circuits and larger regional networks interact to shape perception and memory? In addition, we are interested in how experience early in life (Fetal Alcohol Spectrum Disorder), or aging and dementia (Alzheimer's disease) can influence sensory system function.